M81 was discovered by Johann Elert Bode in 1774. The galaxy is sometimes called Bode's Galaxy, after its discoverer. M81, short for Messier 81, was named after an astronomer who re-identified the galaxy in 1779. The object was listed in the Messier Catalogue by Messier and his assistant Pierrre Mechain. Both gentlemen were comet hunters, and needed another category to put astronomical objects that were not comets. Messier 81 is the largest galaxy in the M81 group, which is a group of 34 galaxies in the Ursa Major constellation. This group is one of the closest groups to our own Local Group of galaxies, at a distance of about 11.7 million light-years from Earth. 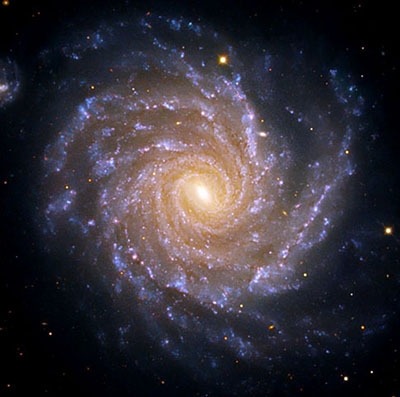 Because the galaxy is luckily tilted at an oblique angle to our line of sight, it gives us an incredible opportunity to see a spiral galaxy from a "birds-eye view". It is estimated to be 12 million light-years away from us. Its large size and higher brightness, make it a good object for amateur astronomer's study. M81 can be seen through binoculars or a small telescope, and can be found at approximately 10 degrees northwest of Alpha Ursae Majoris.